It is Spring in Las Vegas! The average temperature ranges from 63 to 70 degrees Fahrenheit, making it the quintessential time to be outdoors. 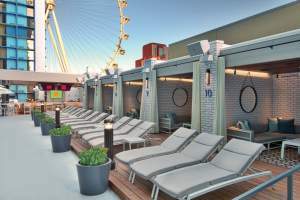 From watching college basketball to enjoying Spring Break, here are story ideas from The LINQ Promenade and High Roller, the world’s tallest observation wheel. Spring Activities for Families: No matter the age or budget, families will find plenty to do. Children six and under can ride the High Roller observation wheel for free. This special offer is available now through April 15. Click here to buy tickets and enter Offer Code: HRKID18. Starting at 5 p.m. nightly, Brooklyn Bowl opens with 32 bowling lanes. C & E Studios is “where the magic of art begins.” While strolling through The LINQ Promenade, see resident artists as they use spray paint to create live artwork to the delight and amazement of spectators. 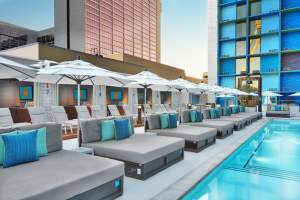 The Pool @ The LINQ: The 21-and-over pool offer 35 poolside daybeds and 10 grand cabanas, all available for daily rental. Behind the DJ booth, an above-ground pool with two see-through windows on each end makes for the perfect photo opportunity. 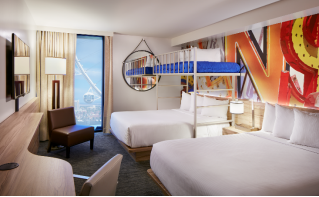 The LINQ Hotel & Casino: Grab a group and book a Bunk Bed Deluxe Room, measuring 350 square feet and featuring two queen pillow-top beds with one twin-size bunk bed loft. The room is designed with light, modern furnishings and bright pops of color. Happy Half Hour: More popular than ever, the High Roller offers Happy Half Hour, where guests enjoy 30 minutes with an in-cabin open bar. Daytime tickets are $40 while nighttime tickets cost $52. On Fridays, guests may also find themselves in specially curated Sauza Tequila cabin, featuring a brand ambassador providing insight into the Sauza history, products and more. Spring Essentials: For flip flops, shades and bathing suits, The LINQ Promenade features specialty retails such as Havaianas, Chilli Beans and Pier 30 showcasing the latest spring trends and must haves. Al Fresco Dining: Multiple locations feature expansive outdoor patio seating such as Chayo’s, Brooklyn Bowl (located on the second floor, overlooking The Fountain Stage), ameriCAN Beer & Cocktails, Yard House and Off The Strip. 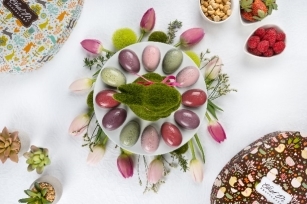 High Roller Easter Chocolate Tasting (March 22 and March 29): Hop onto the High Roller this spring to indulge in holiday chocolate tastings provided by Ethel M Chocolates. Guests will savor egg-shaped, premium chocolate pieces filled with fresh-crafted, gourmet flavors of the season such as peanut butter and strawberry while enjoying the best views of Las Vegas from 550 feet in the air. During the 30-minute rotation in a glass-enclosed cabin on the High Roller, an Ethel M chocolatier ambassador will discuss the origins of chocolate and how the pieces were created, all while encouraging guests to savor each aroma, taste and texture. Click here for pricing information and to book reservations. National Beer Day (April 7): Did you know that more than 300 types of beers are available throughout The LINQ Promenade’s restaurants and bars? Multiple locations offer large selections of beers including ameriCAN Beer & Cocktails, Yard House and Tilted Kilt Pub & Eatery. Light It Up Blue (April 12): The High Roller once again will team up with Touro University Nevada to recognize Autism Awareness Month. 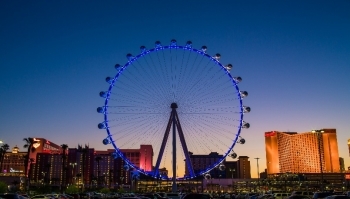 Nevada community members and families will enjoy a ride on the High Roller and celebrate with a ceremonial lighting of the observation wheel to turn it blue for the evening. Relay For Life (April 14): The LINQ Promenade will host the first Relay For Life event on the Las Vegas Strip, located in The LINQ Promenade’s east parking lot. The event will take place from 10 a.m. to 10 p.m. Click here to spring into action and help fight cancer. Locals attending the Relay for Life also receive special room rates at The LINQ Hotel & Casino and Flamingo Las Vegas April 12 to April 15. Enter Promo Code RELAY18 when booking at Caesars.com. Earth Day (April 21-22): The LINQ Promenade will go green this Earth Day, showcasing sustainable art by Las Vegas artists, demos and pop-up shops all along the outdoor district throughout the weekend. The Sunday festival will conclude with a sustainable fashion show. Additional details will be announced later this month. 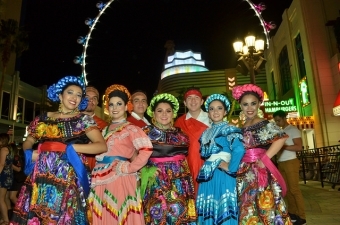 Cinco de Mayo (May 5): Festive décor will line the streets of The LINQ Promenade during the annual Cinco de Mayo festival. Entertainment will include a nine-piece Mariachi band, Viajero, accompanied by traditional Mariachi dancers. Guests will enjoy street tacos, Mexican style corn, margarita specials and live entertainment hosted by Chayo Mexican Kitchen + Tequila Bar. To celebrate the Mexican holiday, the High Roller will be lit green, white and red. Mother’s Day (May 13): This Mother’s Day, moms ride free on the High Roller. Receive a complimentary ticket with the purchase of an adult ticket on Sunday, May 13. Click here to purchase tickets. The LINQ Promenade, an open-air shopping, dining and entertainment district anchored by the High Roller, the world’s tallest observation wheel, redefines the already-iconic Las Vegas skyline. 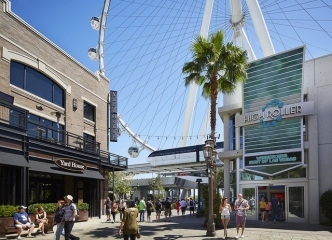 The LINQ Promenade features more than 30 unique retail, dining and entertainment venues and plays host to a variety of special events, festivals and more. Expected to launch by the end of 2018, Fly LINQ will become the first and only zipline on the Las Vegas Strip and will feature 10 side-by-side zip lines, capable of simultaneously launching all riders. The High Roller consistently ranks as one of the best, “must see” attractions by media outlets and websites around the world ranging from the Travel + Leisure to USA Today and TripAdvisor. The wheel’s 28 glass-enclosed cabins feature an interactive experience including video and music that fade away to unveil spectacular views of the famed resort city in the 30 minutes it takes to complete one full revolution. Each cabin accommodates up to 40 people. Unique in-cabin experiences including the Happy Half Hour (for guests ages 21 and over including an open bar inside the cabin during the 30-minute ride); North America’s first in-cabin Chocolate Tasting with Ethel M Chocolates and Yoga in the Sky (a 60-minute experience that can accommodate up to six guests per one-hour session). Cabins are also available for individual or group experiences. For more information, please visit TheLINQ.com. Find @LINQPromenade on Facebook and follow on Twitter and Instagram.